On this second to last day in February, it is another one of those old fashioned winter blustery days. We received another foot of snow last night so the season’s total now exceeds 250 inches. Since the wind chill is well below zero, to document some of the snow I decided to just drive out to Coast Guard Point. For those of you who have homes out there and have not arranged for snow plowing, if you want to visit your home you may want to call ahead to have someone unbury it. Below are a few shots of some of the buildings out on the point. Last month I included a photo taken of the southwest side of my house where the snow drifted over my woodshed, which is attached to my garage. Below is a shot taken from inside my sun porch, looking west at the center portion of my home. 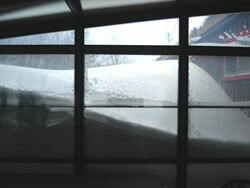 Note that the bottom of the red-trimmed windows is over 7 feet off the ground. The last photo featured this month is one that I took from the top of the bluff at Hilltop Cabins the day after I arrived back from my trip out west. 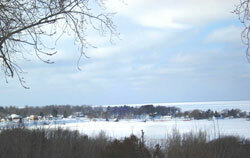 It shows that the bay in Grand Marais is frozen along with the area along the shore.